When on the road, there is much gear and many items to check off your checklist while you’re transporting your horse. The hustle and bustle of traveling can cause horse owners to forget one very important step: protecting your horse. One of the best ways to protect your horse in the trailer is to bandage the legs and the tail. 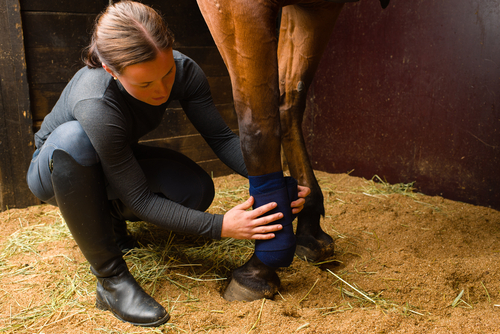 Bandaging the legs below the knee causes compression and makes it easier for the horses to maintain their balance since they are working their muscles while you’re steering left and right. This will also protect them from any cuts or scratches from the bottom of the stall. Bandaging the tail is good way to ensure that your horse does not rip out tail hair or get caught in the stall gate and prevents injuries to the skin under the tail if their tail sits over the top of the gate. Bandage your horse for safe travels!